Now that you’ve identified the purpose of your speech, it’s time you craft it. But before you do, it’s important to clarify your topic. One way to make sure you’ve got it all cleared up is to try out the “business card test” - can you state your main idea on only one side of a business card? If you can, you’re ready to move on. If you can’t, keep working on it until you can. Now, you can start drafting your speech. Grab a sheet of paper and right at the top of the page, clearly state your desired topic and the goal of your presentation. Then move on to write your opening lines and follow that up with 4-5 key points. Back these points up and summarize them in the conclusion. This is your outline. Now that you’ve listed your most important subjects, you can begin crafting your presentation based on the completed outline. Martin Luther King, Jr. started his powerful speech with a strong, passionate story which set the mood for the rest of his speech. When you begin crafting your speech, you have to remember that the most important part is your introduction. If your audience’s attention is not captured within the first 30 seconds, you’re pretty much history. Your introduction can make, or break, your entire speech. Remember that a strong opening is King, pun unintended. You may start with a probing question, a strong statement, a personal story or even a quote. 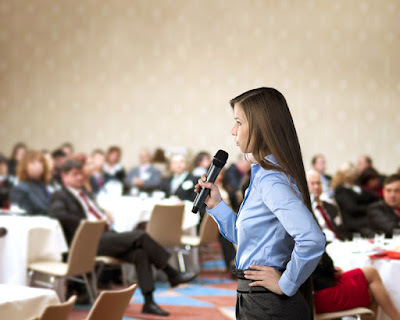 These elements not only set the mood for your speech, but also pique your audience’s attention and focus sufficiently to hook them for the rest of what you have to say. Now that you’ve crafted a powerful introduction, you can move on to the core points of your speech. Each of these points should be backed by interesting stories, illustrations, historical references, humorous anecdotes, and examples that the audience may be able to relate to. Common stories or illustrations include references to common childhood occurrences, growing up pains or even teenage experiences. You can use these stories and examples to further reinforce your point. Humans are sensory creatures. If you’re able to pique more than just one sense - their hearing - you’ve got them hooked, forever. Remember to include descriptives in your stories and even images for the visual ones in your audience. Analogies help your audience connect the dots of your points in their heads. Also remember to open and close each point with a clear transition. This makes it easier for your audience to follow your story. For those of you who’re selling to or motivating your audience, you may even address your audience’s pain, stress on the benefits of taking immediate actions, suggest a recommended course of action followed by closing remarks. Now that you’ve detailed all the main points of your speech, you can start to write your close. A common, but effective, conclusion is a summary. This can be followed by an appeal or a call to action to challenge your audience, which is completely dependent on your purpose and topic. Run a quick summary by your audience and if necessary, outline clear guidelines and next actions they can take with the information you’ve just given them so that they do not feel like they’ve left your speech with nothing concrete to take with them.